From the "water wars" of Latin America and South Africa to the battle against corporate takeover of agriculture, the revolt that began ten years ago lives on. Protesters block police line from moving forward in a downtown Seattle intersection November 30, 1999. Ten years ago, tens of thousands of people poured into the streets of Seattle to protest the WTO ministerial and the global trade agreement that sought to expand global corporatization at the expense of communities around the world. The protesters came from all walks of life–they were teachers, students, faith-based people, farmers, unionists, environmentalists, human rights activists, people of color… ordinary citizens. They came to express their outrage, to show solidarity and to demand change. While the trade ministers and corporate lobbyists found themselves trapped in their luxury hotels as activists blockaded intersections, hotels, and the Washington State Convention and Trade Center, the Steelworkers marched side by side with the Turtles and Butterflies. The relentless use of pepper spray, tear gas and rubber-and plastic-jacketed bullets did not deter French and US farmers from breaking bread with their counterparts from India, Mexico and other developing countries, nor did it lower their determination to get the WTO out of agriculture. The events from November 26 to December 6, 1999, have come to hold a special place in political movements of the twenty-first century. The Battle of Seattle has been described repeatedly and has been the focus of several documentaries and even a full-length feature film, as well as the subject of a study commissioned by the Pentagon. In an effort to undermine the mobilization that took place there, activists were soon labeled protectionists and called names like “globophobes.” After 9/11, media pundits declared the demise of the “anti-globalization” movement, while WTO officials even referred to activists as “intellectual terrorists” in an attempt to criminalize dissent. 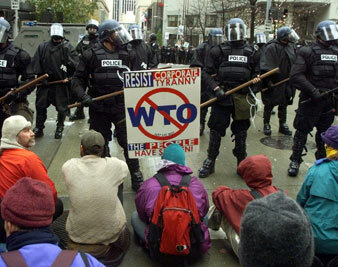 On the tenth anniversary of the Seattle protests, it is important to recognize that they did not merely bring about the collapse of the Third WTO Ministerial. Seattle was, in fact, a tremor of courage that sparked international mobilizations for social, economic and environmental justice and set in motion strategic, determined and cross-border organizing that continues to this day. This is evident in the international struggle for the human right to water. The threat of privatization and the increasing lack of access to clean water for the world’s poor have catalyzed broad social movements. From mass protests in Cochabamba and water wars in El Alto that, respectively, drove the multinationals Bechtel and Suez out of Bolivia, to constitutional amendments in Uruguay protecting the public nature of water, to communities in South Africa subverting the pay-to-access system that was denying their basic human right to water, people around the world have come together to prevent the loss of their water resources. Similarly, the 2008 food-price crisis, which pushed an additional 100 million people into extreme poverty with over a billion people–one sixth of humanity–undernourished, has galvanized global civil society to demand the right to food for all while pushing back against forces jeopardizing food security. When WTO director general Pascal Lamy tried to conclude the Doha Round in April 2008 as a “solution” to the global food crisis, more than 250 farmer organizations, NGOs, trade unions and social movements from over fifty countries were quick to deliver a strong snub. Their demand that countries be free to protect farmers’ livelihoods and promote food security and rural development has thwarted every effort to prop up trade liberalization and the WTO as a solution to world hunger and poverty. Challenging the corporate takeover of our food and agricultural system, the resistance against genetically modified crops also continues to grow around the world. In October the Irish government announced a ban on the cultivation of all GM crops, while South Africa rejected GM potatoes the same month. Mobilization by the landless workers movement in Brazil resulted in agrochemical multinational Syngenta handing over its 127-hectare experimental farm in Parana to the state government in October 2008. The land, used by Syngenta for GM field trials, is now producing native seeds for distribution to small farmers and impoverished countries that have suffered devastation from hurricanes. Ten years of determined activism has prevented implementation of the WTO’s Doha Round of trade liberalization. Indeed, as trade ministers head to Geneva for the seventh WTO Ministerial Conference on the tenth anniversary of Seattle, Pascal Lamy has been compelled to lower expectations for the meeting to avoid yet another failure. Instead, under the theme, “The WTO, the Multilateral Trading System and the Current Global Economic Environment,” the ministerial will assess the WTO’s “contribution” to solutions to global crises. As the spin advisories pitch the WTO as a way to deal with the most pressing issues of our times, social movements, labor unions and civil society organizations are demanding a “WTO turnaround” instead of the same failed policies. The December 21, 2009 issue of The Nation that goes to press this week will feature a series of articles on where the fight for fair trade and humane development policies is headed ten years after “The Battle of Seattle” moved these issues to the center of the global debate. Anuradha MittalAnuradha Mittal is the founder of the Oakland Institute, a policy think tank dedicated to increasing public participation and promoting debate on social, economic and environmental policies that impact our lives.